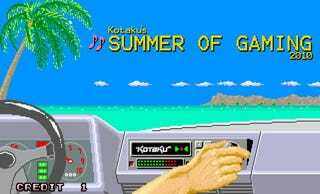 Kotaku's 2010 Summer of Gaming might be over, but there's still plenty of sunshine left this season. Why not spend the time looking over the summer-related things we wrote about last week? From the first flash of the lovely Plunkett-powered opening image to this sad farewell, we've shared memories this Summer of Gaming that will last us forever, or at least until the next Summer of Gaming rolls around. There's one every year you know. Why Aren't There More Video Game Sand Castles?